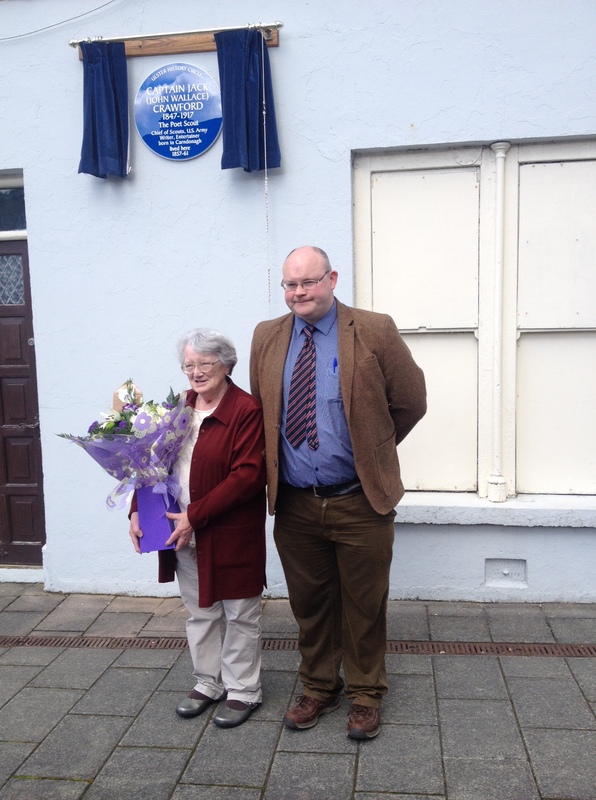 Maura Harkin, historian and archivist, with Ray Lannon, chair of Colgan Heritage Committee at the unveiling of the Crawford plaque in the Diamond, Carndonagh. This is the first blue plaque in Inishowen. Jack Crawford’s story is stranger than fiction – the story of a boy who was born in Carn in 1847 in poor circumstances during the Great Famine and who went on to achieve fame as Chief Scout or reconnaissance officer of the US army. When he died in New York 100 years ago, his name was a household word. His parents were Scottish so the Ulster Scots connection is very strong. He was baptised in Hillhead Presbyterian Church on 4 March 1847, the same church where his parents were married and their children were baptised. Both parents went to America and left the Crawford children in the care of an uncle, who lived in the Diamond; Jack had a free and easy life but now and again, he had odd jobs for example as a cattle herd. But at the age of 15, Jack became restless, left Carn and joined his parents in Pennsylvania. Having never attended school, he was illiterate and found work in the coalmines of Pennsylvania for less than 2 dollars a week, just like the hired children on the Laggan here in Donegal. America is the land of opportunity and between 1861 and 1865 the American Civil War was in full swing and young men were in demand not only on the battlefields but on the ranches and farmlands. At 17, he joined the army but was injured and was hospitalised. The Sisters of Mercy took him under their wing, and during a nine week stay in hospital taught him how to read and write, thus opening up a whole new world to the ambitious Jack Crawford. After the war, he held a position as postmaster in Pennsylvania and started to write poetry, the first steps into a literary career. Marriage followed but the call of adventure was too strong and in his late twenties, he was back in the army, this time as Captain with the Cavalry of the Black Hills Rangers of Dakota. America was in the throes of the Indian Wars, this time against the Sioux, a bloody period when the state attempted to drive the Indians off their lands into reservations. It was at this time that he met Bill Cody – better known as Buffalo Bill – and Jack got Cody’s job as Chief Scout of the Fifth Cavalry. Jack’s deeds of daring brought him to national prominence. His greatest feat was when he rode 350 miles in 4 days to carry dispatches about a victory at Slim Buttes to Fort Laramie. The news was flashed across the American press and he became a household name. Cody was impressed and invited him to join his Wild West Show and here he got a taste of the world of entertainment, storytelling and singing for which he had a flair. After a year with Cody, he branched out and created his own Wild West Show and began touring across America. There was great interest in this type of entertainment, especially stories of deeds of daring by US citizens and Jack Crawford had captive audiences everywhere. The Indian Wars were ongoing and the Apaches were in the mainstream. Adventure called again for the third time and Jack re-located to New Mexico, again in his role as Chief Scout. When this phase of the wars ended, Jack settled again into civilian life and dedicated more time to writing. He seems to have made some money because when he returned to America, he joined up with a group of investors and headed for the Klondyke. (He did not meet Micí McGowan, who made a fortune in the gold rush and came home to Gortahork where he built Whalebone House which still stands). But as thousands found out, the hills were not paved with gold. Captain Jack Crawford died in New York in 1917. His papers are in the library of New Mexico for anyone who wishes to do further research. The final piece of the jig saw is a local one. The Schools Folklore Collection of 1937 has an interesting article by Vera Butler (Doherty), then a teacher in Glassalts NS, who says she got his story from relatives. In a long contribution, she recounts how her father met Jack in New York in 1902 and they dined together, exchanging stories about Inishowen and no doubt getting an account of his courthouse appearance. Jack gave him a book of poetry so maybe this is still around somewhere in Carn. Vera adds that she got a copy of his poems as a present from her father. The mystery of Jack Crawford deepens. But that is a story for another day! He certainly had a full life. (See duchas.ie for Vera’s hand-written account/ Donegal/ Glassalts NS). (with thanks to Ulster Scots Agency which funded the plaque, Maura Harkin, Maud Hamill and Mairead Ferguson of Ulster History Circle for promotion and research, John Cunningham, Glentogher for church register, Dessie McCallion and Colgan Heritage Committee).